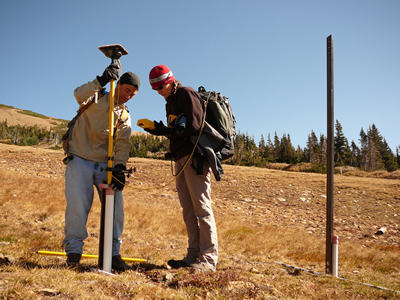 The Niwot Ridge Long Term Ecological Research (LTER) area, located approximately 35km west of Boulder, is one of 26 field sites devoted to ecosystem studies in the larger LTER Network. Numerous studies in the area are currently underway, and in September UNAVCO provided researchers at the University of Colorado-Boulder one GPS unit with which to conduct hydrological surveys of the area's wells. The group's main interest is to determine the subterranean water elevations of the wells, and it will then use this data to establish subsurface flow, subsurface storage, and seasonal fluctuations in hydrologic source waters. This data can then in turn be combined with water chemistry and water stable isotope data to further climate, hydrology, and water quality knowledge. The surveys were conducted using PPK techniques. The UNAVCO Polar engineering group took advantage of the field opportunity to visit its test bed receiver and power system, which was originally installed in 2005. The unit's power system was checked and tested, and a new Iridium communications system was installed, mimicking the PoleNET set-up that is being deployed in Greenland (GNET) and Antarctica over the next several years. 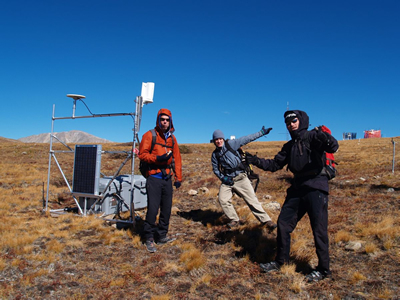 As the test site lies in alpine tundra at 11,600 ft. in elevation, the environmental conditions resemble those found in Polar regions, and hence provide a natural, local setting to test and maintain a PoleNET-style GPS site. Figure 1 - Graduate student Ashley Nielsen and GIS specialist Todd Ackerman survey one of the many wells in Ashley's study area. By measuring the water level relative to the top of the PVC pipe with a plumb line, and then using the GPS data, they will be able to determine the true elevation of the water level. Figure 2 - Polar engineers Bjorn Johns, Marianne Okal, and Thomas Nylen relax after installing the Iridium communications at the GPS site. The Iridium antenna is visible on the far right of the photo.